For too long Hufflepuffs have been overshadowed by other Hogwarts houses, but not anymore. With Fantastic Beasts's Newt Scamander (played by real-life Hufflepuff Eddie Redmayne) stepping into the spotlight, the house is finally getting the recognition it deserves. Sure, Gryffindors are brave, Slytherins are ambitious, and Ravenclaws are smart, but Hufflepuffs are pretty darn loyal friends. 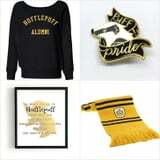 As Fantastic Beasts: The Crimes of Grindelwald gets ready to come out, it's time for us Hufflepuffs to wear our black and yellow stripes with pride. If you're a badger and don't care who knows it, we highly suggest investing in these magical gifts.